Introducing NEW DISCOUNTS FOR SENIORS, Mystery Pic, Smuggs Resort Review, Injury Lesson, Women XC Gold. This week, SeniorsSkiing.com is very happy to introduce Discounts For Seniors, a new feature that brings real savings to our readers. 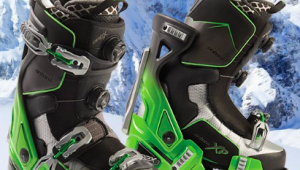 All our research surveys have revealed a constant finding: Senior snow sports enthusiasts—our readers—are looking for discounts. Knowing that, we have curated a number of vendors who have agreed to offer interesting products at 15-20% and more discounts to our readers. 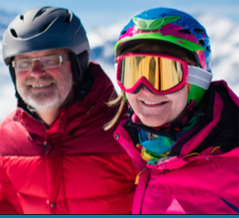 From the beginning of SeniorsSkiing.com, we have recognized that our readers are not just winter sport participants; our readers are active all year round—hiking, kayaking, sailing and lots of other sports in non-snow months. You also have grandchildren. So our select collection of vendors is eclectic, presenting ideas for products you can use as well as for gifts you can buy for friends and families. To access our Discounts For Seniors page, click here. Note the discount code on the ad and click through to the vendor’s site to order. We are quite excited about this new offering to our readers. Please let us know what you think. Big, high, dry, up in the sky: That’s Taos. Credit: Val E.
Another Mystery Glimpse to puzzle over. This has proven to be a popular feature, highlighting historical photos from ski museums across the country. However, for the first time, we had a submission of a mystery photo from a reader. Perhaps you have a curious old picture from the past or about ski lore you might want to post. Let us know. 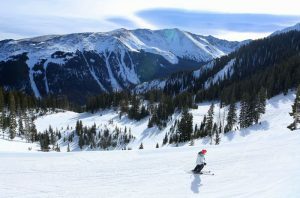 Correspondent Val E. reports on Taos, the high country ski area in New Mexico which seems to cast a spell on people who ski and live there. Perhaps it’s the altitude. Click here to read his Taos review. 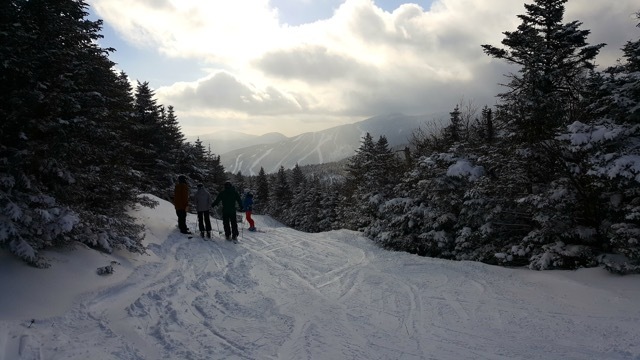 In another Resort Review, correspondent Tamsin Venn tells us about Smuggler’s Notch, way up in Vermont, next to Stowe. She reports on intermediate trails that range from mountain top to bottom which offer seniors a chance to ski confidently. At the same time, did you know that Smuggler’s has the only triple black diamond in the Eastern US? Lots of variation for families. Unfortunately, correspondent Yvette Cardozo had a “routine” fall that turned into a significant injury. She opines on recovery and reflects on lessons learned. Finally, XCSkiResorts.com publisher Roger Lohr offers his thoughts on the amazing first gold Cross Country Olympic medal for the women’s team sprint. His prediction: Cross Country racing is going to get a big boost from this historic victory. 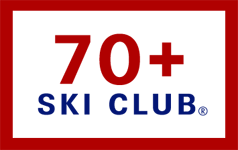 Thanks to all readers who have offered to financially support SeniorsSkiing.com. Your response is gratifying; we very much appreciate your help in defraying costs. On to March. We hear the Sierras are getting big snow at last; let’s hope the crowds come out. Meanwhile, tell your friends about us. There are more of us every day, and we aren’t going away. There are lots of blues at Smuggler’s for cruising seniors.